The Promise of Reconciliation? 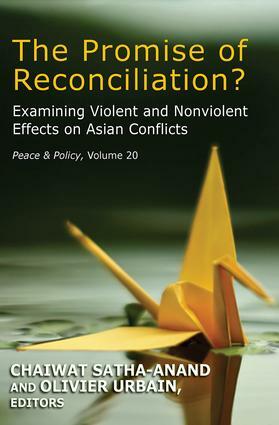 explores the relationship between violence, nonviolence, and reconciliation in societal conflicts with questions such as: In what ways does violence impact the reconciliation process that necessarily follows a cessation of deadly conflict? Would an understanding of how conflict has been engaged, with violence or nonviolence, be conducive to how it could be prevented from sliding further into violence?The contributors examine international influences on the peace/reconciliation process in Indonesia's Aceh conflict, as well as the role of Muslim religious scholars in promoting peace. They also examine the effect of violence in southern Thailand, where insurgent violence has provided "leverage" during the fighting, but negatively affects post-conflict objectives. The chapter on Sri Lanka shows that "successful" violence does not necessarily end conflict�Sri Lankan society today is more polarized than it was before its civil war. The Vietnam chapter argues that the rise of nonviolent protest in Vietnam reflects a profound loss of state legitimacy, which cannot be resolved with force, while another chapter on Thailand examines "Red Sunday," a Thai political movement engaged in nonviolent protest in the face of violent government suppression. The book ends with a look at Indonesian cities, sites of ethnic conflicts, as potential abodes of peace if violence can be curtailed.